Toolroom Precision, CNC Setup Flexibility! After working with Tormach® PCNC customers as a consultant for many years, I have learned a few things. You want to setup your machine quick, you want simple solutions that work, and you want rugged, precision products that last the lifetime of your new CNC. Tosa Tool Modular Tooling Plates and Accessory Plates are the easiest way to get your perfect virtual designs out of your cad/cam and into reality. SLASH setup times, IMPROVE quality, and MAXIMIZE the capabilities of your machine tool investment, and your time. Most of the small mill owners I have met are constantly developing ideas and considering machining new things on their mill. These types of mill owners will quickly realize the benefits of a Tosa Tool modular fixturing system. Parts will be set up faster with a higher degree of accuracy and a significant cost savings over current methods. Exceedingly tight tolerances between bore centers (± 0.01 mm / ±0.0004”) give users the confidence that modular fixtures built today can be rebuilt a month, a year or a decade later to pinpoint accuracy. With just one set of modular tooling, an unlimited number of fixtures can be built. In addition, changes can quickly be made on the fly during the prototyping process. A single purchase of a modular fixturing system can easily last as long as the lifespan of a CNC machine. Imagine never having to worry about fixturing costs again. Our system is designed with precision ground and hardened components to be reused over and over for years to come. Racks of rusting dedicated fixtures will become a distant memory. A single package of modular fixturing can be neatly stored and organized inside lockable drawers in a workbench. No more wasted time in looking around the shop for missing fixtures. With decades of experience our engineers are available to help solve any fixturing problem. Many new components are a result of collaborative efforts with our customers. The idea behind Modular Fixturing is simple: Eliminate the hassle and cost of dedicated fixtures and their maintenance, and replace them with precision, flexible components. Tosa Tool expands upon these core concepts with a unique array of modular tooling plates, a diverse set of components to go with them, and the ability to create your own plates and components if you desire. 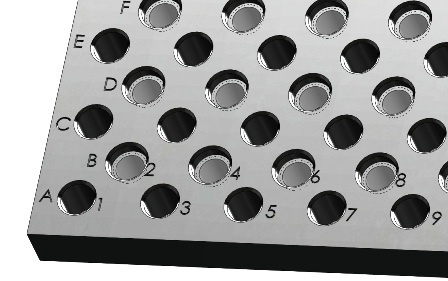 Every Modular Tooling Plate and component comes with its CAD Solid file in any format you require. All of our components are designed in SolidWorks, but we can easily convert them to any format you require. Assemble your entire setup virtually before you pull out the toolbox. Want to machine something that is bigger than the 9″x18″ work envelope on a Tormach PCNC1100®? This is where your Tosa Tool Modular plate really excels! Simply make your self a plate that fits your workpiece and the modular table and move it around the Tormach’s work envelope! Because the Modular Plate is SO accurate you can move your project many times and keep all the accuracy! Its like having a much bigger machine. Wish you had a pallet changer to maximize your productivity? 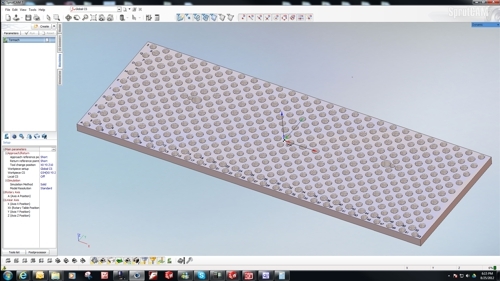 It is extremely easy to build one around your Tosa Tool Modular Fixturing Plate. Contact me for solutions to your specific situations!